The details surrounding this photo are controversial, let's ignore that for a second and look only at the photo itself, more specifically examine the anatomical features of the photo. Compare the photo to a gorilla, a muscular human, and Patty. In the Hovey photo the shoulders have a very dramatic slope. The human, gorilla, and Patty have a slope to the shoulder that is less steep. Also between the Trapezius and the Deltoid there is no notch or angle between these two muscles. This notch is created by the separation of the two muscles and the bony landmark at the AC joint where the clavicle (collar bone) meets the Acromion process of the Scapula (shoulder blade). 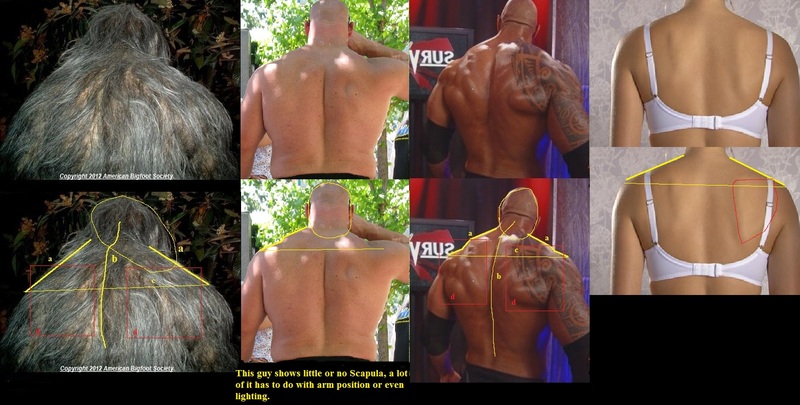 Another difference is that the Hovey photo shows a 'hump' or ridge on the surface of the body between the back and head. The gorilla and Patty have no ridge at all, their back flows seamlessly into the back of the head. Humans have a smaller ridge but it is usually less pronounced than what we see in the Hovey photo. 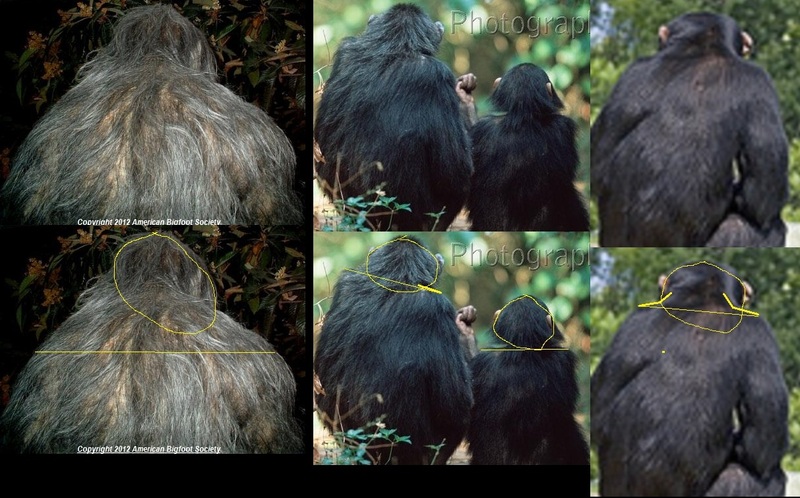 The position of the head in the Hovey photo is quite different from the gorilla and Patty. The gorilla and Patty the head sits low relative to the proximal end of the Humerous (top of the upper arm bone). The position of the head relative to the Humerous in the Hovey photo appears to be similar to humans. Bill Munns argues successfully that the Patterson Gimlin Film is authentic because a human head would not be able to "get inside the costume." It is easily conceivable that a human form could "fit into the costume" of the Hovey photo. The last thing I will cover is that the lack of visible Scapula in the Hovey photo. Given how clear and deep the depression running along the spine is it surprising that the area between the spine and the arm is flat and featureless. 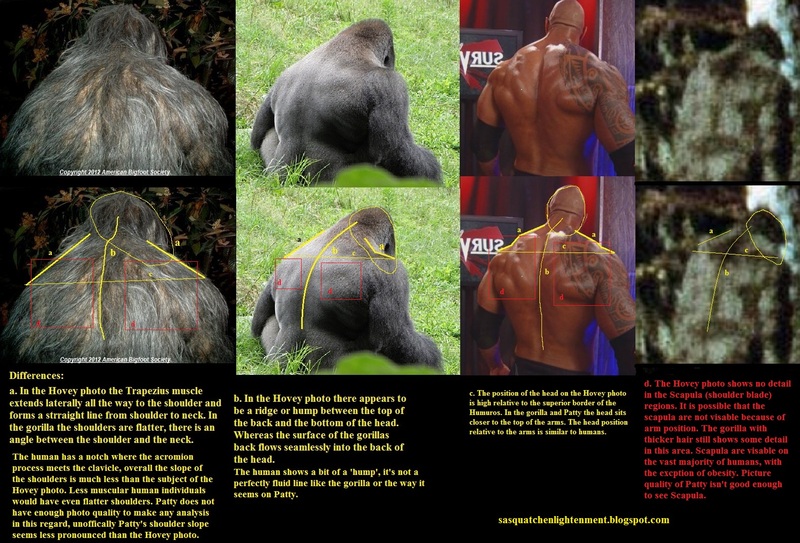 Scapula are visible on most humans, they can also be seen in the gorilla photo. The musculoskeletal anatomy in the Hovey photo lacks features that suggest it is a living relict hominoid.